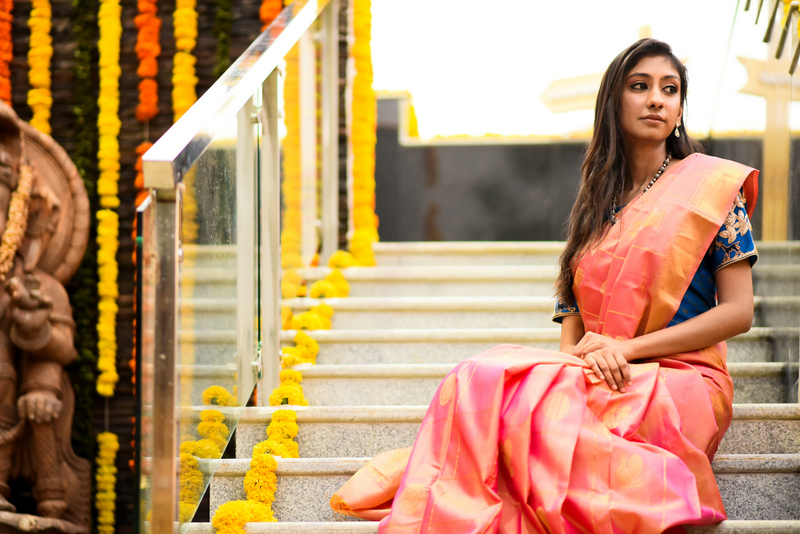 One of the latest boutique-labels to open in Hyderabad, She Is, is the brainchild of Sai Priya Tucker. A sprawling place in Jubilee Hills, with a nursery and a cafe on the side, the place proves to be an instant visual attraction. It caters to Bridal & Wedding Couture, with a wide range of clothing from western gowns to rich Kanchi silk sarees. 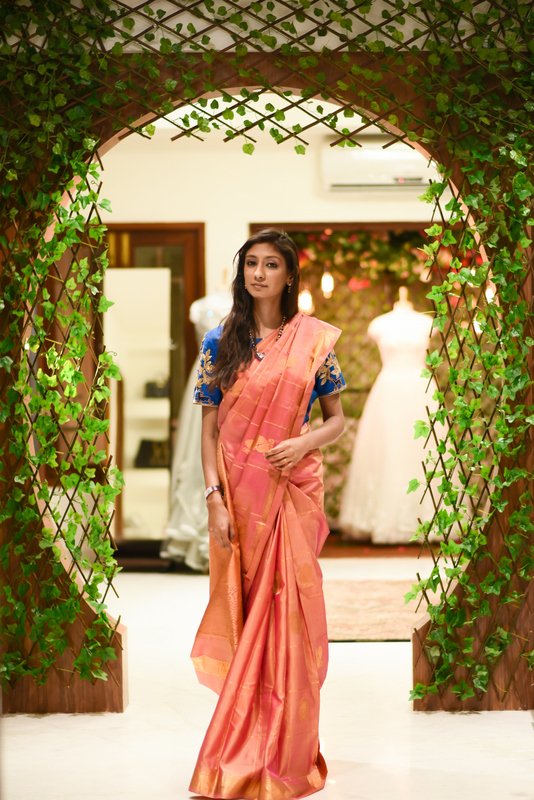 They recently had a bloggers-styling-meet where we got to style the best of Kanchi silk sarees by giving it our own spin. 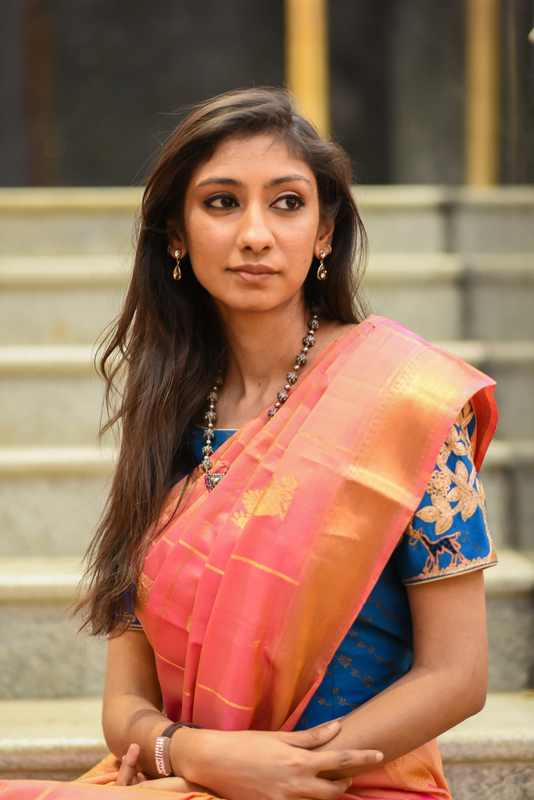 I’ve always loved wearing sarees and I’m quite comfortable in them. And being a proper South Indian Telugu girl, silk sarees are not new to me at all! Through the years, I’ve managed to build quite a collection, along with my entire set of bridal sarees, which were all (obviously) expensive silk sarees. My experience helped me in instantly spotting my favourite colours and picking out the best from the collection at She-Is. A lovely blush pink saree with orange tones to it, and a zari-less border was what I opted for. 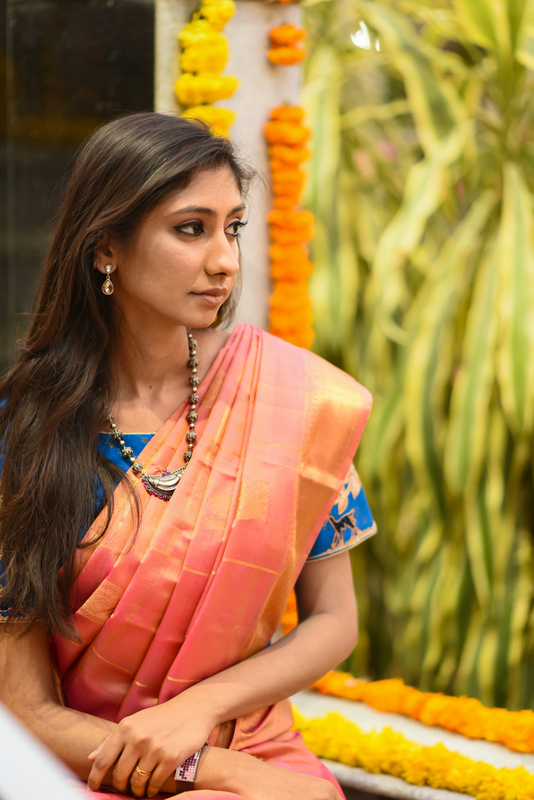 A silk saree doesn’t always have to be heavy and unmanageable. The one I picked was light weight with no work on it at all, and was a single colour tone, which meant I could play around with colours for the blouse and opt for a really contrasting colour. While the people the store were trying to guide my attention to the typical gold or orange blouse (which would be the first obvious choice to pair this saree with), I laid my eyes on this long sleeved, blue blouse with embroidery work on it. The surprising colour contrast worked really well, and accentuated the colour of the saree. 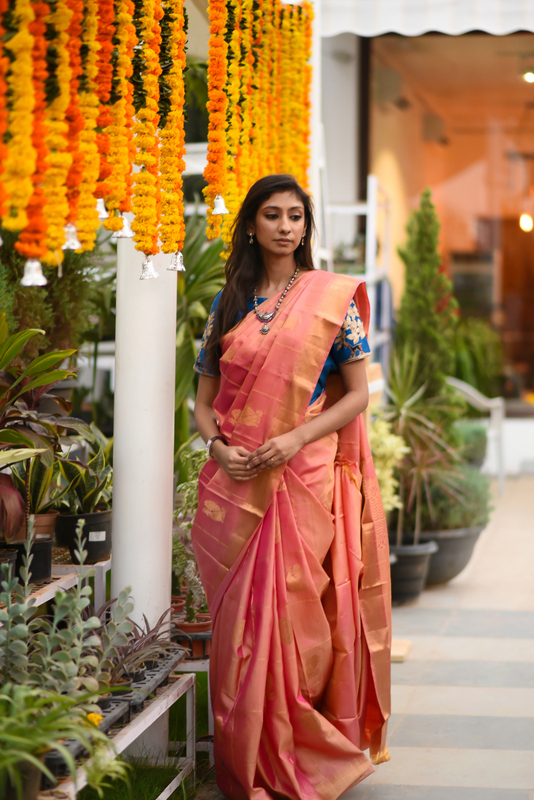 So if you are looking for a new place where you can browse traditional silk sarees, casual ones or even couture wear, She-Is is the place to be! This saree is really gorgeous as it is beautifully blended with the modern and contemporary style. 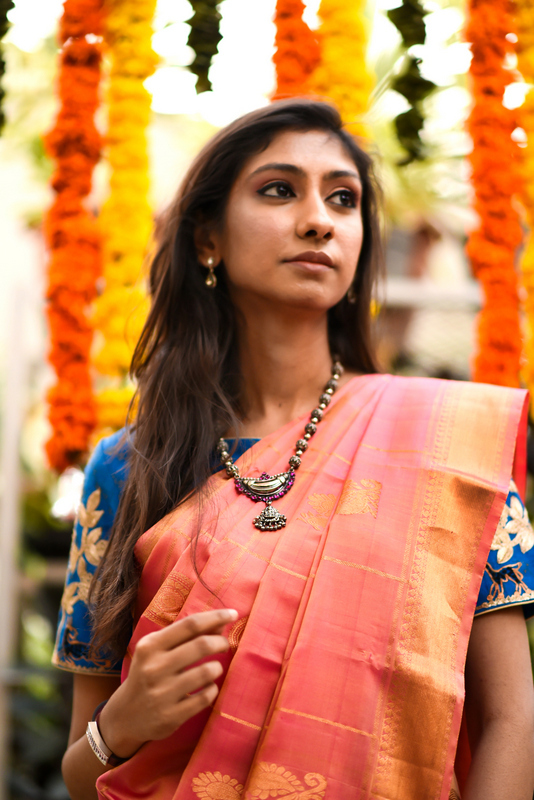 There are jewelry pieces that will surely go with this style of saree. Ornate Jewels is an online jewelry store that has the large and unique collections of trendy jewelry that too at an affordable price which helps you to choose beautiful unique jewelry designs. To know more visit our website.